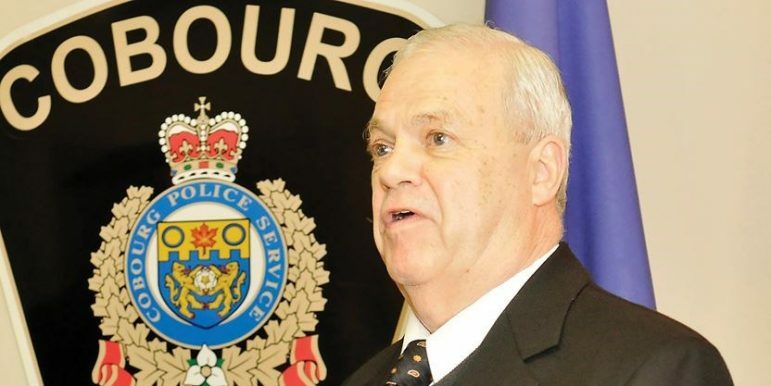 Former Chief Administration Officer for the town of Cobourg Bryan Baxter was also the chair of the Cobourg Police Services Board for eight years after his retirement from the town hall. He died last Wednesday. The obituary of former Cobourg Chief Administrative Officer Bryan Baxter last week briefly outlines a remarkable career. He worked for the Town for over 39 years, as well as serving on the Police Services Board for eight years, mostly as chairman. It also noted he was 76 years old. He is survived by his wife Louise and his children and grandson. What it fails to capture is the person. His quiet demeanour. His patience. His dry wit, along with an often ironic sense of humour. The twinkle in his eye when you would find him out walking his dog and, with his binoculars in hand, watching birds. Mr. Baxter began working for the Town before he graduated high school. He was born in Cobourg, staying his entire life. He was offered his first job at the Town before completing his exams. So, he worked in the day, studying at night. Then, he took time off to go back and write the final tests. He would continue to work, doing correspondence courses at night to get his degree from Queen’s University. His training would not end there, as he continued to take courses through various professional associations, further developing his knowledge and skill. He would go on to serve on many committees within those organizations, like the Federation of Canadian Municipalities, Association of Ontario Small Urban Municipalities, Ontario Municipal Administrators Association, Association of Municipal Managers Clerks and Treasurers and the Association of Municipalities of Ontario. Not surprisingly, he often served in leadership roles. But it was never done for the prestige, accolades or attention. In fact, it was quite the opposite. His soft-spoken approach masked his encyclopedic knowledge of provincial legislation and process. Sitting in a council meeting, a politician would ask a question. The group would all turn and look to Mr. Baxter. He would cite chapter and verse the relevant law, bylaw or procedure. He would do it every time without blinking. Even the most obscure tidbit was recalled off the top of his head. It was so natural; nobody would think twice. But for the careful observer, it was amazing. His low-key delivery and unflappability were hallmarks. He would answer endless questions during interviews, carefully explaining in intense detail all aspects. However, there were times when he would be tested, ever so slowly becoming redder in the face and his voice tightening. Yet he was the consummate professional, never losing his control and always gracious in the end. The most intriguing aspect of Mr. Baxter was his life outside of work. He loved the outdoors. He was a keen birdwatcher, a hobby he picked up when his children were young. It became a lifelong passion. One of the most memorable moments was during a Christmas bird count on Boxing Day in 1989. It was a bitterly cold day with a bright blue sky driving out of town, eastbound along Old Highway 2, going over the bridge. Just before hitting Workman Road, Mr. Baxter suddenly pointed to a fencepost across a field. There, sitting in a tiny white bundle, was a Snowy Owl. It was beautiful. Any ordinary person would not have seen it perched majestically against the snow-covered fields and background. But he did. More miraculous was his ability to identify birds by their call. Walking in the woods, it was impossible to see anything with an amateur eye. Yet, silently walking, Mr. Baxter would name the bird, sometimes including gender, under his breath. He kept a detailed diary of all the birds he spotted and would often take a chance to do some birding when he travelled. One of the most memorable times for him was when he went to Mzuzu, Africa, as part of the Municipal Twinning program in the 1990s. When he returned, he spoke with great enthusiasm about the birds he spotted during the trip, often taking time in the morning to go out before doing the day’s business. As a member of the Willow Beach Field Naturalists, he would serve on the executive for more than a decade, including as president. His knowledge of policy, helped group secure a charitable number, often a lengthy and challenging process. He was quick to roll up his sleeves to assist and was said by others to be a joy to work with on projects. Mr. Baxter also was also instrumental in creating the Northumberland Land Trust, a group dedicated to getting landowners to donate parcels of naturalized land to be preserved for the future. A natural extension of his love for the outdoors was his involvement in the Boy Scouts, serving a leader for both cubs and scouts. He was also a man of faith, spending his entire life at St. Andrew’s Presbyterian Church. He was appointed the youngest elder and served in that position for 50 years. Not only did he provide leadership and guidance for the church, his job as an elder meant he was responsible for ministering to the spiritual needs of a group of individuals and families. Many people remark on Mr. Baxter’s compassionate and empathetic qualities. Some say he was like a father figure, while others will talk about his deep caring. It could be found in the less public aspects of his life, like the church or his volunteer work delivering Meals On Wheels. But it was also there in flashes in this professional life, as well. He was generous in a multitude of ways, but always away from the spotlight with dignity and grace. He was also a massive fan of the Canadian Football League and an ardent Argos supporter. It is impossible to read a bylaw, minutes of a meeting or a Town policy without recognizing Mr. Baxter’s influence. Even when they are revised, the changes build on his work. It is also impossible to look around Cobourg without seeing his legacy, either in the way the police service is run or the various roads, sewers, sidewalks, housings, and industries he would have touched. It is challenging to reconcile such an incredible contribution with such a humble man. Yet, given a chance, it is not. As promised, I have taken time to consider this and what is next for me in regards to local news in Northumberland County to see how I can contribute after losing my column last week. I have a plan. What happens to archives of community newspapers shut down in the Torstar-Postmedia deal?